It's Hip 2 Serve! : Awesome AAFES Deal! UPDATE: It appears that this item is no longer available. Darn! For any of you with kiddos, check out this deal found on aafes.com. 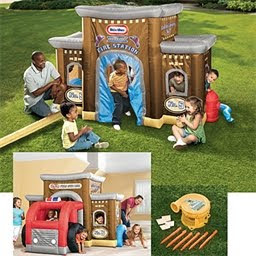 You can now purchase the Little Tikes® Inflatable Fire Station Playhouse (Item Number: Q591G) for only $22.27!! This item was originally priced at $97.95 so this is a savings of 77%! You can also use promo code adcotm at checkout to receive an additional 10% off. This means you can get the playhouse shipped to you for a total of $24.99. Note: This item is now on backorder but you can still purchase it at this awesome price! What a great Xmas gift to stock up on now!